Just saw this idea on Pinterest and had to share! 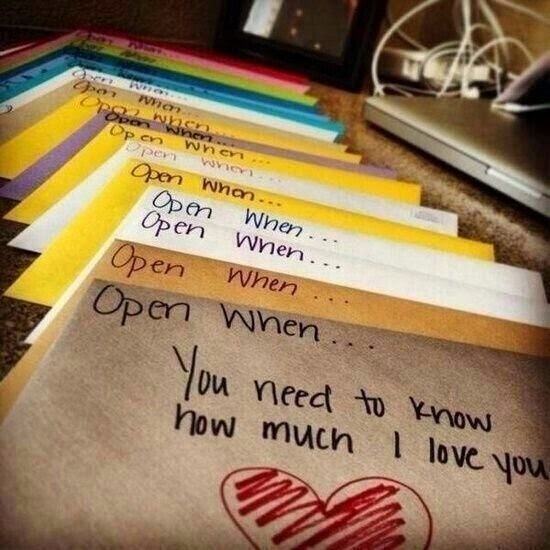 Write “Open When” letters for that special someone in your life! Such a sweet and meaningful Valentine’s Day present. These letters are designed to let someone know just how much they mean to you. Be creative and have fun, but most importantly, let the letters be honest, personal, and handwritten by YOU! You have probably heard the saying “It’s the little things in life that make it special,” but do you really believe that? I do. A smile on someone’s face can make your day or just a simple compliment to know you are doing alright. Looking back over the years, I remember more of the little things, instead of the big pictures. The little moments help piece together the bigger ones. My favorite story comes from being in the eleventh grade. I was having a bad day and of course, it was raining. As I walked from one building to the next, I slipped and fell. Slipping and falling is a daily occurrence for me, but what I remember about this story is that my friend, I was walking with, kept going. He didn’t see me fall, until I said something. This story stands out for me, because I remember calling his name and saying I had fallen. From that information, I’m able to piece together the remainder of that day and always bring a smile to my face remembering it. Whether it’s a funny moment, listening to your favorite song, or reading an article about a baby, with hearing difficulties, hearing their mother’s voice for the first time, it is the little things in life that make it all worth it. My challenge to you today is remember the little things that help you remember today for years to come.